The “Steven Thomas” leaves Crisfield daily at 12:30, arrives at Tangier at 1:45, leaves Tangier at 4:00 and returns to Crisfield at 5:15. More information on Steven Thomas Cruises. You can also take the mail boat “Courtney Thomas” from Crisfield to Tangier. This boat leaves the Crisfield town dock at 12:30 Monday through Saturday. The “Chesapeake Breeze” leaves Reedville at 10:00am and returns to Reedville around 3:40. The boat leaves from Buzzard’s Point Marina. It takes about an hour and a half to get to Tangier. More information about the Chesapeake Breeze. A seasonal passenger ferry operates from the picturesque town of Onancock on Virginia’s Eastern Shore. This passenger ferry service runs from May through September. You’ll ride out to the island on the “Joyce Marie II,” a 36 foot lobster boat, similar to a traditional Chesapeake Bay deadrise. The boat’s captain, Mark Crockett is a friendly native Tangierman. The boat leaves from the Onancock Wharf, located at the end of Market Street. More information about the Onancock to Tangier ferry. These round-trip cruises provide a nice trip on the Bay and several hours to visit Tangier. These cruises are quite popular and summer days can bring hundreds of visitors to the island. There are a few cars on the island now, but most transportation is by bicycle and golf cart. Residents meet the tour boats at the dock to offer guided golf cart tours. Golf carts and bikes can also be rented for self guided exploration. Take some time to explore this unique village of independent Chesapeake Bay residents. The best things to do on a visit to Tangier Island are to enjoy a meal, take a stroll down the town streets, stop for a drink, ice cream, or homemade desert, and enjoy the views. The new Tangier Island History Museum and Interpretive Cultural Center opened in June of 2008. The museum provides a closer look at island life, including Tangier’s role in the War of 1812. Tangier Island, VA sits out in the middle of the Chesapeake Bay, accessible only by boat or plane. The island is only about 1 mile wide and 3 miles long and has about 700 residents, most of whom make their living off the water. Captain John Smith first visited Tangier Island in 1608 and in 1620 settlers arrived from Cornwall, England. Today, the island is home to a close knit community, many of whom are related. Visitors will find that many of the residents they meet have the last name of either Crockett, Parks, Pruitt, or Thomas. Most of these residents make their living crabbing in the Chesapeake Bay. The island has one school for kindergarten through 12th grade, a post office, and two grocery stores. 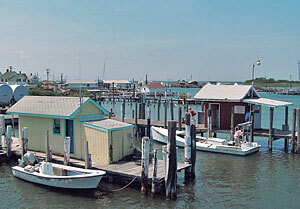 The Tangier Island of today has several lodging establishments and restaurants. Ferries travel to the island daily from Reedville and Crisfield. Read about Tangier Island restaurants and bed & breakfasts – Bed & breakfasts and restaurants, with traveler reviews. Dining options on the island include Hilda Crockett’s Chesapeake House, where visitors are served a traditional meal of crab cakes, clam fritters, Virginia ham, potato salad, coleslaw, pickled beets, apple sauce, green beans, hot corn pudding, fresh baked bread, and butter pound cake, all served family-style at large tables. A breakfast is also available. Open 7:00 am to 5:00pm. More information about Hilda Crockett’s Chesapeake House. At Fisherman’s Corner Restaurant, fresh local seafood is the specialty, from crab cakes to stuffed flounder and crab bisque. Open for lunch and dinner, 11:00 am to 7:00pm. More information about Fisherman’s Corner Restaurant. Lorraine’s Seafood and Sandwich Shop features homemade daily specials and a variety of seafood, subs, sandwiches, and salads, plus coffee, milkshakes, smoothies, and soft serve ice cream. Open 10:00am to 2:00pm and 5:00pm to 10:00pm on Monday through Friday, 10:00am to 2:00pm and 5:00 pm to 11:00pm on Saturday, and Noon to 5:00pm on Sunday. The Waterfront Restaurant, located at the Tangier dock, offers a selection of sandwiches, including crab cakes and soft crabs, and subs. They also have bike rentals available. Open 10:00am to 4:00 Monday through Saturday and 1:00pm to 4:00pm on Sunday. Chesapeake House. On main street near the dock. Serves big family style dinners. Shirley’s Bay View Inn. One of the island’s oldest homes. Includes a full breakfast. Tangier Island Travel Reviews. Read traveler reviews. 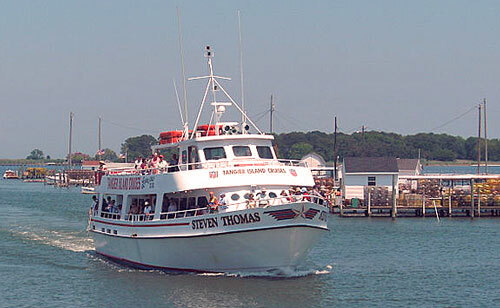 Tangier Island Cruises from Crisfield: Aboard the Steven Thomas. Tangier Island Cruises from Reedville: Aboard the Chesapeake Breeze.